We may actually hear a collective sigh of relief and happiness from players, for this announcement. As it stands, everyone hates PKers. There can be no player that likes the existing loophole in which black-name pkers can still lock all their items with item locks, so that you won’t have a chance to get at their items. Well, good news! This will change! The new PK system will now seize black-name PKers' equipment, no matter if it's locked or not. (Coat and Exp Balls excluded) Not to fret though, red-name pkers will not drop equipment when killed. So exercise some restraint out there, and know when to stop before it’s too late! Additionally, if you are killed by Guards, your equipment will not be dropped. If you help to kill a black-name player and seize their equipment, a reward claim notice will appear when you open your inventory. Their equipment will be seized! The number of items seized is determined by the PK points of the black-name player. 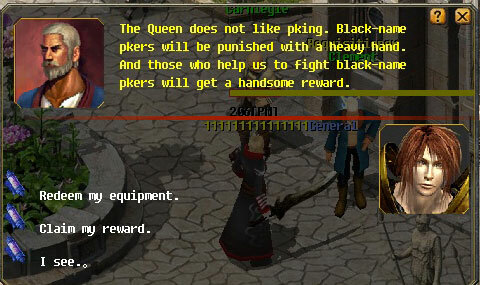 The higher their PK points are, the more equipment that will be seized when they are killed! The redeemed price is determined by the item value. If your equipment is seized, you can redeem it from Clement, in Cronus(142, 348), within 7 days. 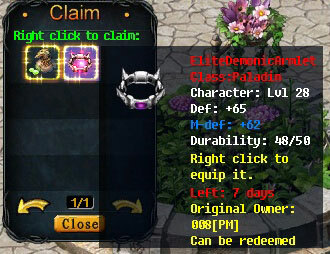 Click on the 'Redeem' button and the redeemed equipment will be in your inventory! If you help to kill a black-name player and seize their equipment, you can claim your reward from Clement, in Cronus(142,348). All equipment can be seized, including locked and untradeable ones. Unlocked Items Can be Seized! If the original owner does not redeem it in 7 days, the bounty hunter can claim it as a reward. Locked Items Can be Seized! If the original owner does not redeem it in 7 days, the bounty hunter can claim it as a reward. Untradable Items Can be Seized! 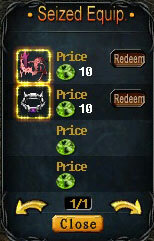 If the original owner does not redeem it in 7 days, it will be destroyed and the bounty hunter can get EP as a reward. Of course, in a PK Tournament, family war map, legion war map and prison, no equipment will be seized!